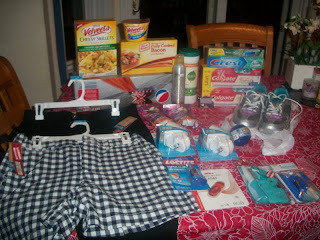 We went to Target today to look for a going away gift and to use some of my Target coupons that were going to expire. I had a very good shopping trip. First stop was the clearance clothing section, because I had two $5 off Merona bottoms coupons. I found a pair of black capri pants. They were originally $21.99, on clearance for only $5.48. With my $5 coupon they were only 48 cents!! Another great find were the Trim Step shoes. It was Kara who saw them first. She was trying them on, and said she liked how tall she felt. I told her that they were for grown ups, and that she didnt need to shape her behind. LOL! She told me to try them on, because they were very comfortable. Since I do need to work on my behind, I went ahead and decided to get them. They were originally $34.99 on clearance for $17.49. I might have waited until they went to 75% off, but I don't think they will last that long. There were only 4 pairs left and only 1 in my size. Hopefully they work. 2 Febreeze Noticeable Warmers at $2.99 each. I had 2 coupons for $3 each from the P & G flyer. Both warmers were FREE. In the Health and Beauty section, I also found a few great deals. On the toothpaste end cap I found Colgate Total with FREE toothbrushes on clearance for $1.48. I had two. 50 coupons which made them .98 each. They also had a Crest Scope Outlast on clearance for $2.11. I had a $1 Target coupon, which made it $1.11. Inside the box was $10 worth of more coupons. If I use just one of those coupons, I make most of what I spent back. Diet Pepsi 12 pks were on sale for $3.33. I had a $1 Target coupon, which made it $2.33. I just remembered that I had a .75 coupon that I forgot to use.. Oops.. I have another Target coupon, so hopefully next time. Full price I would have spent $138.43 ($142.57 with tax), I spent only $58.97 with my additional 5% Target card discount. I used $27.65 in coupons, and saved $48.95 in clearance prices. My overall savings were 59%. We ended up not buying a going away gift at Target. Kara changed her mind several times on what she wanted to get. Right before we left, she found these best friend dolls. 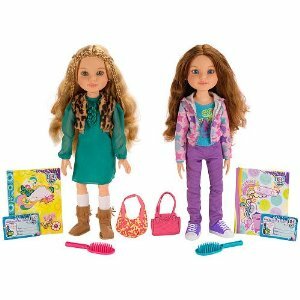 There was a blond doll named Kaitlyn that actually looked like Caitlyn. There is also an Addison doll that looks a lot like Kara. She thought it would be cool if she gave the doll that looks like herself to Caitlyn, and she kept the look alike Cailtyn doll. There was one little problem with that idea, they were totally out of the dolls that looked like Kara. (what she wanted to give to Caitlyn) We decided to go to Meijer to see if they had them, and found they do not even carry that line of dolls. She then had to chose another gift. She couldnt decide between a Little Pet Shop Sparkle Pet, a webkinz or a Zhu Zhu puppy. She finally went with a the puppy that looks like Cailtyns dog, after me finally giving her 10 seconds to decide. (after 20+ minutes in the toy aisle) At that point, I was ready to go home and she was being way too indecisive. I might still buy Kara a Caitlyn doll and surprise her with it at Christmas. Hope Caitlyn likes her gift.